Summing up the week, we recall the new statements of SEC representatives regarding the classification of Ethereum, tokens and steylcoin, a curious change in the policy of providing the USDT token, and also assess the overall positive developments in the markets. On Saturday, March 16, the weighted average rate of Bitcoin for the first time since February 24, returned to the marks above $ 4,000 , reaching, according to CoinMarketCap, the maximum value of $ 4,077. 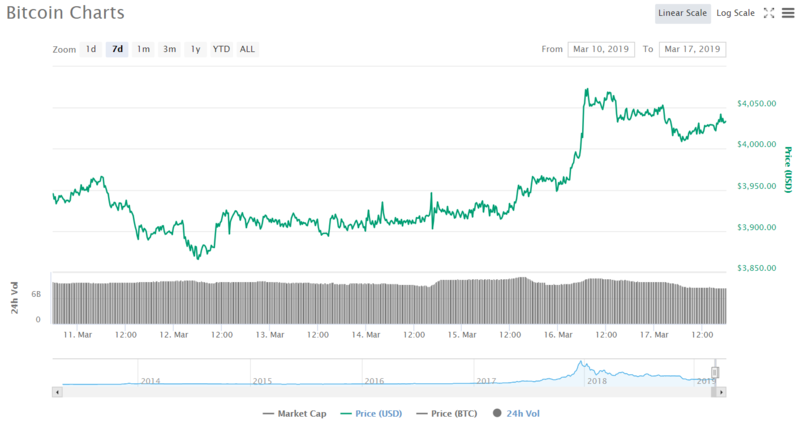 Sure upward movement was accompanied by a surge in trading volumes – the day before this figure was the first time since April last year when the first cryptocurrency was trading around $ 8,845, exceeded $ 11 billion. Weekly growth of Bitcoin amounted to 2.44%, capitalization rose to $ 71 billion. As a cryptocurrency expert Kevin Rook pointed out on Twitter, in general, over the past five months, BTC trading volumes have grown by about 150%, while average daily volumes today are at their highest rates since January 2018. He also points out that over the past 12 months, only 9 days showed trading volumes above $ 10 billion, and five of those nine days were in March 2019. 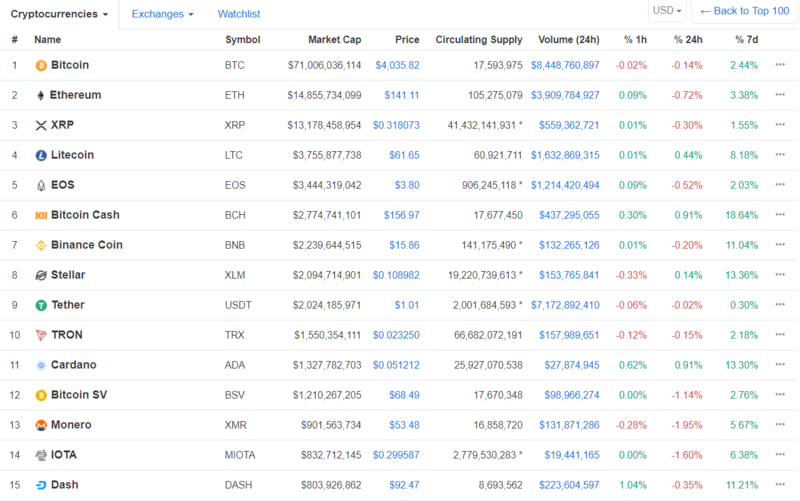 On the positive wave, the week and the rest of the market is closing, with the most impressive indicators in the top ten of CoinMarketCap demonstrated Bitcoin Cash (18.64%), Stellar Lumens (13.36%) and Binance Coin (11.04%). Cardano and Dash showed the highest growth among the closest pursuers – 13.30% and 11.21%, respectively. Ethereum ends the week by trading at $ 141 (+ 3.38%), Litecoin (+ 8.18%) has risen above $ 61. The USDT token linked to the US dollar, as was assumed until recently, is fully secured with hard currency. However, the latest revision on the website of the issuer of steblockcoin of the company Tether says that the situation is now different. We are talking about the USDT collateral section, and as the company now claims, each coin is provided with “reserves that include traditional currency and cash equivalents, as well as, from time to time … other assets and upcoming loan proceeds that Tether provided to third parties “. At the same time, the company insists that each token is still pegged to the USD in a 1×1 ratio. Earlier, Tether stated that all USDT coins are 100% secured by the US dollar. In part, these allegations at the end of last year were confirmed by Bloomberg. This week, the chairman of the US Securities and Exchange Commission (SEC), Jay Clayton, expressed the opinion that the Ethereum, the second most capitalized cryptocurrency, most likely cannot qualify as security. Thus, Clayton agreed with the statement made last year by the head of the SEC Corporate Finance Department, William Hinman. “I agree with Hinman’s explanation that a digital asset transaction may cease to be an investment contract. For example, if buyers have no reason to expect that a person or group of individuals will show management efforts and entrepreneurial skills. Under such circumstances, a digital asset may not constitute an investment contract in the context of the Howie test, ”said the head of the SEC. Somewhat later, Commissioner’s senior digital asset adviser Valerie Schepanik, however, said that the norms of securities legislation could apply to some types of steklokoinov. According to her, one stablecoin can be tied to real assets like gold or real estate, another to fiat currency, and the third to use various “financial mechanisms that support price stability.” It is the third category, in its opinion, that can become the object of close attention of the regulator. One of the main newsmakers of the week was project Stellar. So, on Tuesday, March 12, the Stellar Development Foundation introduced a new logo , abandoning the “spacecraft”, which has long been associated with this cryptocurrency. The very next day, the leading US cryptocurrency exchange Coinbase Pro announced support for Stellar Lumens (XLM) . Soon we can expect the appearance of XLM on the main platform Coinbase.com and in mobile applications. And on Friday it became known that the Stellar Development Foundation was headed by the former Mozilla chief operating officer Denel Dickson. In this position, she changed the creator of the project Jed McCaleb. The latter took the position of chief architect and will be responsible for further developing the protocol and creating a strategy for mass adoption of cryptocurrency. Against the background of these events, the average weighted rate of the coin, having begun its growth last week, rose at a certain point on Thursday to $ 0.111709. 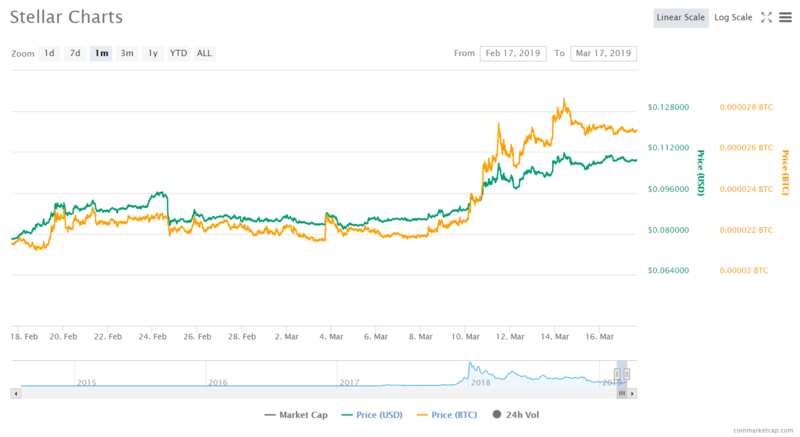 Taking into account a slight correction at the weekend, in general, over the past seven days, XLM has grown by more than 13%, and the cryptocurrency itself, having appreciably strengthened in relation to BTC, has become the eighth largest in terms of capitalization. On Wednesday, March 13, Tendermint Inc. officially announced the launch of Cosmos Hub , the first of the Proof-of-Stake blockchain series, which will become part of the Cosmos ecosystem in the future. Work on the project, designed to ensure compatibility of different blockchains – primarily Ethereum and Bitcoin, has been carried out over the past three years. The release of Cosmos Hub units started on Wednesday, March 13, at 23:00 UTC. Transactions with Cosmos ATOM’s own tokens are not yet available to users. These tokens will serve as a kind of collateral for validators, and they are currently used as a mechanism for choosing Cosmos Network membership. And on Friday, Poloniex announced the listing of the token of the ATOM, although the trading is still unavailable as of now: users can only view the balances, for which they need to enter a seed phrase from the corresponding wallet in the exchange interface. The ATOM trades in pairs with Bitcoin and USDC will be open after voting of the Cosmos network members for activating the transfer function. At the same time, Tendermint Inc. reported about attracting $ 9 million for the development of the Cosmos ecosystem. Serie A’s round of financing led Paradigm hedge fund, managed by Coinbase co-founder Fred Ersam. On Tuesday, Bittrex International announced the launch of its own platform for initial exchange offers (IEO). The first such campaign involving a game-oriented RAID project was to take place on Friday, March 15 but was canceled at the last moment. The official reason was the gap between the strategic partnership between the RAID project and the company OP.GG. Representatives of the trading platform felt that in such a situation holding a tokensail contradicts the interests of investors. Another reason for the decision Bittrex could be an investigation in the publication of Coinspeaker, which further questioned the integrity of the creators of the project. This week, the Tokyo District Court recognized the former CEO of Mt. Gox Mark Carpeles guilty of falsifying documents and sentenced to two years and six months in prison. Nevertheless, Karpeles has a suspended sentence of four years ahead in order to prove his reliability and avoid a real prison sentence. Note that the prosecutor’s office demanded 10 years in prison for Karpeles, but he was found not guilty on charges of embezzlement and violation of corporate law. “I am grateful to the court and am glad that I was found not guilty of embezzlement and breach of obligations, ” said the Frenchman. Karpeles and his lawyers intend to assess the situation and develop a strategy for action on the charges. On March 12, the State Duma of the Russian Federation finally approved the law on digital rights.T hat it will mean for the crypto industry in Russia, we have prepared a separate material, having disassembled the document. In addition, this week the Central Bank offered to limit the annual amount of crypto active assets available for purchase to unqualified investors. Later, the head of the State Duma Committee on Financial Market, Anatoly Aksakov, explained that the proposal concerns only the participation of unqualified investors in the ICO. This week, the beloved Roskomnadzor, guided by the decision of the Kuybyshevsky District Court of Omsk on July 24, 2018, entered the banned sites in the register and blocked access to four cryptocurrency exchangers: Bestchange.ru, Fastobmen.net, Pushpayer.com and Xchange. cash. In its ruling, the court refers to the federal laws “On the Central Bank of the Russian Federation” dated July 10, 2002, and “On Information, Information Technologies and Information Protection” dated July 27, 2006, as well as the information letter of Rosfinmonitoring and the Central Bank of 2014. Proceeding from them, Bitcoin is recognized as “a money surrogate, which contributes to the growth of the shadow economy, and cannot be used by citizens and legal entities on the territory of the Russian Federation”.